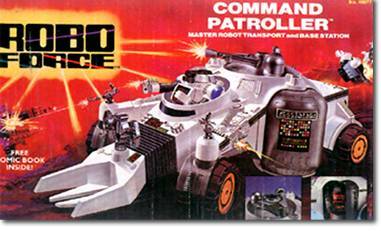 This master vehicle is the ultimate in Robo Force excitement! Freewheeling, with the special "Omni-Directional Steering," this giant vehicle features a working hatch with telescoping robot lift arm, revolving airlock bay doors, a 360° swivel laser tank cannon, front-mounted battering ram and laser cannon mounts. Of course, it accepts all Robo Force Action Robot Figures.